Lockerbie Christmas Eve 1988 The Squadron was involved with the recovery operations following the crash of PanAm Flight 103 on the 21 December. 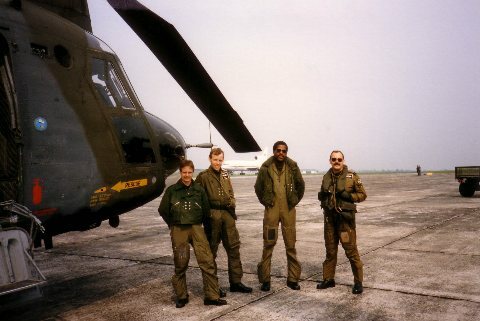 The photo shows (L2R) Will Hughes (ALM), Bill Thompson (Co-Pilot), Mal Reeves (Captain) and Graham Forbes (ALM). 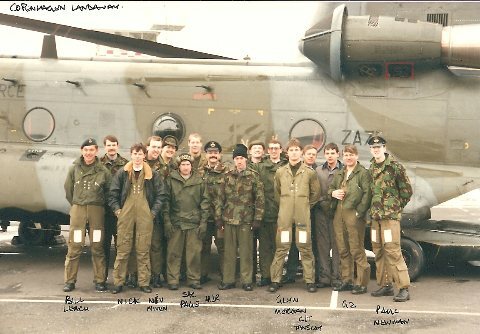 The crews were depolyed on the night of the crash, which coincided with the Squadron Christmas Party, those who arrived late and were sober...were deployed to Lockerbie and continued supporting the Civil Powers until Boxing Day. MALM Graham Forbes, who also flew as one of the Squadron's Display crew, was later killed in the tragic accident on the Mull of Kintyre. 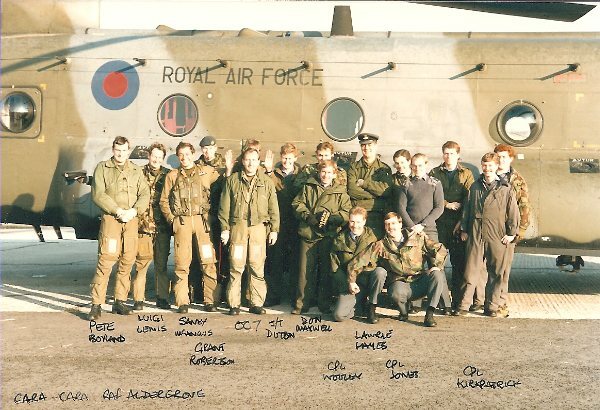 Operation Cara-Cara, RAF Aldergrove. Following the Bombing of a Services coach carrying families at the Ballygawly Roundabout, it was decided to transport all service personel and families by air until the situation was considered safe, a detachment was deployed and remained for some two weeks. During that time we had a free afternoon and it was decided we would have a run into Belfast to a cinema for the afternoon feature, a task came in at the last moment and we deployed. Later that day an IRA Bomb was exploded some 100 yards from the same cinema just as people were filing-in. 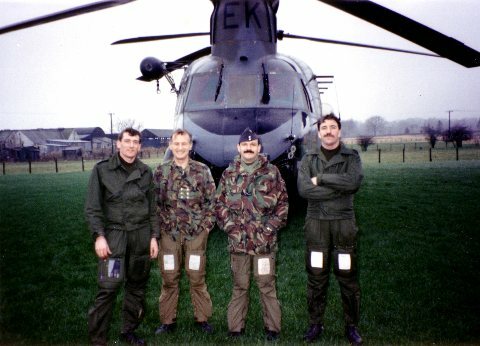 Operation Cara-Cara Aldergrove 26 May 1987. Following-on from the attack on the Families Bus more troop were brought-in to assist, on this day the first flight by an RAF Tri-Star into RAF Aldergrove took place, it can be seen between Nev Hunt (co-pilot) and Harry Whittle (ALM), the rest of the crew are on the left, Dave Harper and on the right (yes me again) Mal Reeves.